Massage therapists regularly treat headache sufferers using trigger point massage and gentle Swedish techniques. Trigger point massage is usually not applied directly to the point of the headache, but in other areas, such as the lower back of the skull, right at the top of the neck. By applying pressure to release tension to the trigger points in this part of the head, pains in other areas, such as the forehead and temples, can be decreased. The massage experience is relaxing and calm. Think of your weekly massage session as your private cave where you can focus on only you for an hour. As your therapist massages your head and body, focus on deep breathing. You may even find yourself falling asleep during these sessions. That’s fine, and your therapist will gently wake you when it is time to turn over, or when the session has ended. But the relaxation benefits of massage don’t end when you get off the table. After a few weeks of regular weekly sessions, you’ll notice that you feel more relaxed throughout the day, sleep better, and feel less anxiety and stress. 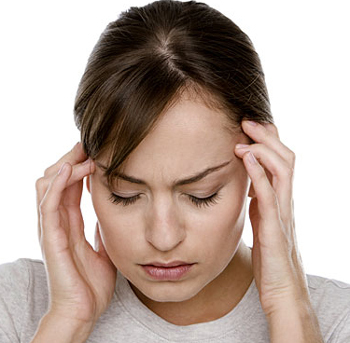 Repeated headaches are often brought on by stress and anxiety in your daily life. Massage therapists will typically use Swedish massage techniques on a headache sufferer’s entire body, rather than focusing exclusively on the head. After seeing your massage therapist for several sessions, you should see your stress levels decrease as your muscles become less tense and more relaxed. Your massage therapist will also work with you to identify external sources of stress and anxiety in your life. Diet, sleep schedule, commute, alcohol consumption, career, and family problems can all increase your stress levels, and make headaches worse. While some stress inducers can’t be solved by massage, you may find that as you address stress through massage, diet, and exercise, the other problems in your life become less stressful as well. Migraine headaches can be brought on by getting too much, or not enough, sleep. Many migraine sufferers tend to toss and turn at night, limiting the amount of deep, quality sleep they get. Without proper sleep, not only are headaches more likely to occur, but you’ll feel foggy throughout the day, your body will be sore, and you’ll be more prone to sickness and injuries because your body needs deep sleep to heal itself. Massage therapy can improve your sleep quality, which in turn will reduce one of the common causes of migraine headaches. You’ll see many benefits throughout the day from having proper, quality sleep besides a reduction in headaches – clearer mental focus, less depression, reduced stress, and more. For common headaches, physicians often recommend over-the-counter drugs like aspirin, ibuprofen (Advil), or acetaminophen (Tylenol). However, a debilitating migraine or other severe and regular headache may require heavier medication to help you get through the day. A combination of antidepressants, triptans, beta blockers, barbiturates, and other drugs are used to combat severe and persistent headaches. If you’re taking a cocktail of headache medication to get through the day, you may notice that the side effects associated with these drugs can outweigh the benefits. Users report weight gain, acne, drowsiness, incontinence, and many other unpleasant effects. Some headache sufferers turn to self-medication through alcohol or illegal drugs, which can cause even more problems. By incorporating regular massage therapy into your headache treatment plan, you can reduce or eliminate the need for most prescription medications. Always discuss medication changes with your primary care physician before proceeding. Regular migraine headaches don’t just hurt your head – they affect every aspect of your life. Work, family and friendships can all suffer as you attempt to deal with debilitating headaches through pain management, staying in bed, or self-medication. By starting a series of regular massage therapy sessions with a licensed therapist, you may find that not only do your headaches stop occurring as often, but you sleep better, have lower levels of stress, and aren’t as dependent on medication. You’ll have more energy, and your massage therapist will recommend specific types of exercise that will help your body feel even better over time. Removing pain and unpleasantness from your body will also help remove it from your life, and you’ll see relationships, your career, and your outlook improve. Looking for massage therapists and massage professionals near your that perform massage therapy for headaches? Use the MassageBook.com directory of massage therapists to find highly rated providers near you. Thank you. I would like to see more like this please.